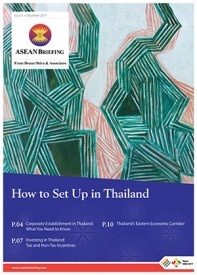 Thailand’s eastern seaboard already enjoys strong connectivity to neighbouring countries and established trade routes. The seaboard has seen success in petrochemical, automobile, and electronic industries. A major focus of the EEC is to improve existing connectivity and foster manufacturing and innovation. The government envisions creating established sea routes from the eastern provinces of Thailand to Myanmar’s on-going Dawei deep-sea port project, Cambodia’s Sihanoukville port, and Vietnam’s Vung Tau port. The government is expanding the Laem Chabang seaport – already the country’s biggest – with the goal of transforming it into a marine hub of South East Asia. To improve connectivity by air, Thailand is expanding the U-Tapao airport in Rayong province substantially. With the opening of a second passenger terminal and runway, the U-Tapao airport’s passenger capacity will increase from its current 800,000 people to 3 million. The expansion will not only facilitate an increase in tourist arrivals – attracted to Thailand’s eastern beaches – but will also transform U-Tapao into a hub for aviation maintenance, repair and overhaul, air cargo, and logistics. 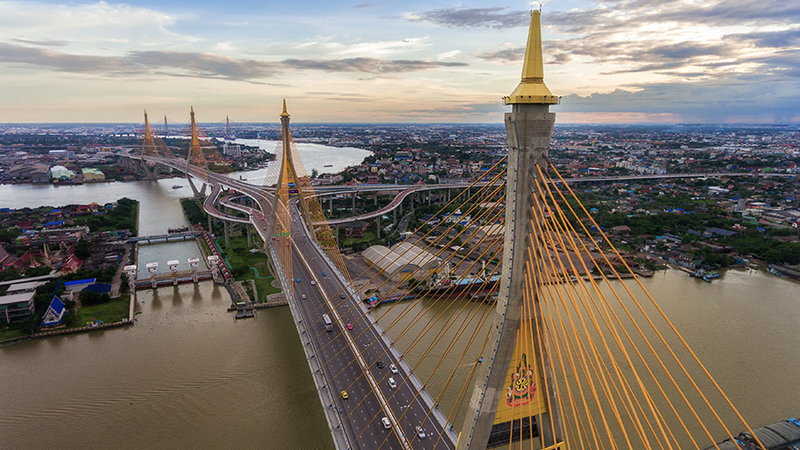 Connectivity by road will improve with the development of high-speed and double-track railways connecting ports, airports, industrial clusters, and major urban centers throughout Thailand. In order to realize the abovementioned four “core areas” of development, the government has identified 15 major investment projects for the EEC. Additionally, the government is planning to build a digital park in Si Racha located on the coast of Chonburi in hopes of developing an Eastern Economic Corridor of innovation (EECi) – a complimentary project which will provide digital connectivity. From the above list, the government has selected five projects to initiate the EEC. These projects will be given initial priority and will provide the foundations for subsequent development in the EEC. The government expects the U-Tapao airport to usher in a wave of new tourists. Developing the airport further will also expand the ECC’s reach into the aviation sector. Here is what the Thai government hopes to accomplish. Develop a new Free Trade Zone as well as a Training Center within airport. The government plans to increase the Laem Chabang port’s connectivity and capacity within the first year of the EEC’s development. Improve railway connection from port. In developing the EEC, the government is prioritizing the creation of faster and more comprehensive routes between airports, ports, industrial clusters, and urban centers. Upgrade railway to double-track between Laem Chabung port and Map Ta Phut port. Under the broader vision of Thailand 4.0, the government’s development strategy, Thailand has identified five existing industries to further develop as well as five new industries to target for additional growth. The government hopes to attract these industries to the EEC through tax exemptions and other benefits. According to BOI, the total amount of foreign investment reached 790 projects by the end of 2016. Foreign investment reached 158 digital projects at US$46.85 million; 64 electrical and electronic projects totalling US$1,090.14 million; 39 automotive projects totalling 1,226.04 million; 49 Agricultural projects totalling US$204.59 million; 10 medical projects totalling US$151.59 projects; 9 automation and robotics projects at US$17.08 million; and 4 aerospace projects at US$12.95 million. The top investors by country include Japan at US$1,133.80 million, Singapore at US$756.11 million, China at US$721.01 million, and Hong Kong at US$558.56 million. While these investments are not limited to the EEC, the government is positioning the EEC to handle much of this forthcoming work. In anticipation for a population surge in its eastern provinces, the government plans to create new cities to accommodate more people. The government envisions these cities as inclusive with international quality education and healthcare. The government is currently identifying potential locations for planned urban growth. What can investors and companies look forward to? The government is hoping to secure much of the funding for the EEC through PPPs and FDI. Offering attractive incentives for both foreign investments and foreign presences in the EEC will be essential in realizing the EEC’s development. 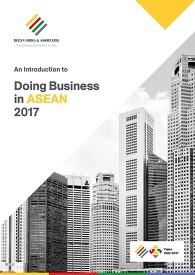 The Eastern Economic Corridor Bill – approved in principle in mid-April 2017 – will amend or suspend more than 100 Thai laws and regulations within the EEC which restrict foreign investment and generally curb the ease of doing business. While the government has yet to finalize a comprehensive list of incentives, the government has announced a major cut in personal income tax to 17 percent for investors in the EEC, land leases of up to 50 years, and a free flow of foreign currencies in the three eastern provinces. Furthermore, a 50% reduction in corporate income tax over a period of five years is now on offer for investors in the three provinces which comprise the EEC. To create incentives within the next generation automotive industry, the government is planning to provide up to eight year tax and import exemptions on vehicle manufacturing depending on the type and scale of their production. Foreign experts operating in key fields will be eligible for tax exemptions between ten to 15 years. The government has also established a Thai Baht 10 billion competitive enhancement fund for targeted industries. The development of the EEC is a clear indicator that the Thai government is aiming to diversify its economy, moving away from previous dependences on the garment and agriculture industries. The government plans to expand urban centers within the EEC and is working to develop advanced training programs to improve its skilled workforce. 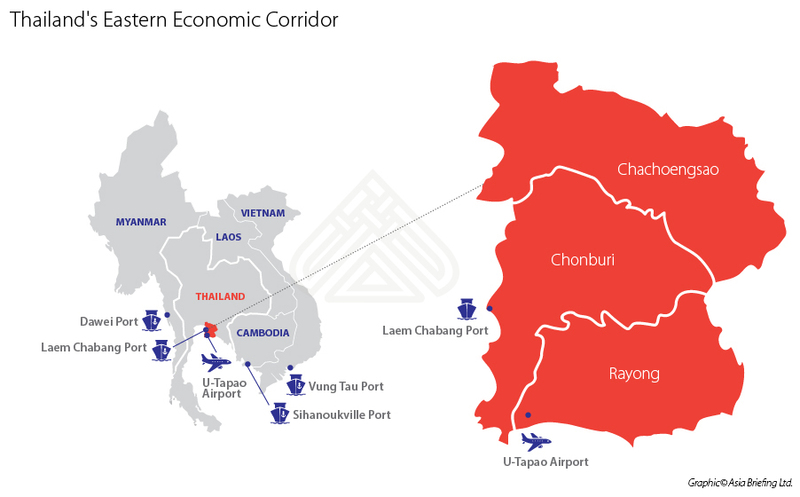 Expansion of airports, railways, and sea ports may very well transform Thailand’s eastern provinces into a robust and dynamic commercial region. With the creation and expansion not only of manufacturing centers but entire cities, the success of Thailand’s ECC may open up Thailand as a premier investment and business location of ASEAN. Editor’s Note: The article was first published on April 28, 2017 and has been updated on June 29, 2018 as per latest developments. Thank you for your update news and information.